There are eight “royal parks” in London — parks which are officially the hereditary possessions of the Crown but to which the public is given access. They are (in alphabetical order): Bushy Park, Green Park, Greenwich Park, Hyde Park, Kensington Gardens, Regent’s Park, Richmond Park, and St. James’s Park. 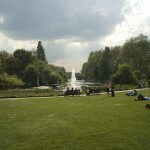 Dogs are allowed in all of the royal parks; in some parts of the parks, however, dogs are either not allowed or need to be on a leash (including “ecologically sensitive sites, children’s play areas, restaurants, cafes and some sports areas”). At certain times of the year, dogs need to be kept away from deer, ground nesting birds and other wildlife. There are signs in the parks telling you which areas to avoid, and the Royal Parks agency has also issued a helpful booklet (PDF) with more details about dogs in the royal parks. For each park, it tells you where dogs are not permitted, and where dogs must be on leashes. Otherwise, it appears, off-leash dogs under voice control are welcome to romp. Remember to bring poop bags, and dispose of them in the marked dog waste bins.